This stainless steel money clip features a rubber inlay with a pattern created from the Montblanc emblem. It also has a matte brushed and polished finishing. 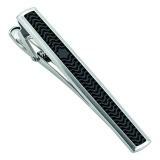 Alligator style clip.